Jill T. asks – Would you be able to explain what happens to peoples money and property if they end up going to jail forever? Prison, by design, is a place where a number of your rights are either stripped away or are severely limited in some manner. The right most pertinent to the topic of conversation today is the ability to freely access your bank account and/or manage any money or assets you may have. First though we should probably mention the distinction between jail and prison as the terms are often, erroneously, used interchangeably. In a nutshell, jails generally serve to hold individuals who are awaiting trial and, in the U.S. are typically run by county offices, whereas prisons hold those who’ve been sentenced and usually run by Prisons and Corrections offices in each state. As with all things in life, there are exceptions here and individuals sentenced to shorter sentences (usually less than a year) can be incarcerated in jails. Moving on, in the United States, with the exception of a few specific types of crime we’ll discuss in more detail in a moment, upon being sentenced, absolutely nothing whatsoever will happen to your money, property and assets. In fact, an often unforeseen downside of being arrested and sent to prison is that you’re still on the hook for all of the financial obligations you committed to prior to being arrested and sentenced including rent, bills and of course debts. But, of course, at this point, you’re likely to have lost any way to make any significant amount of money to pay said bills. So, if you head to prison with a phone contract or even something like a Netflix subscription, that money will continue be vacuumed out of your account each and every month. And due to the fact that you’re, well, in prison, cancelling or freezing these contracts is made exponentially more difficult, and from a practical standpoint resolving this sort of thing can be impossible for some inmates. As a direct result of these problems, it’s not unlikely to leave prison only to be immediately hounded by debt collectors and the like. Along with now having the label of convicted criminal, this generally doesn’t set up a person recently freed from prison to easily be able to become a productive member of society. For this reason and others, many lawyers strongly advise getting your financial life, including settling any debts and getting rid of any bills you can, in order before any kind of potential prison sentence to avoid an unnecessary loss of funds or leaving prison in a worse financial situation than when you entered it, which is extremely common. This can be difficult, however, for those suddenly arrested and unable to post bail in order to potentially have an interim period between jail and prison to get everything in order. Then again, depending on the amount of time you’re sentenced to serve, having something like a Netflix account or similar subscription that takes a very small amount of money from your account each month, can actually be a good idea for some inmates. The reason being that it is the policy of most banks to freeze accounts if no activity is recorded on it for a set amount of time. (The amount varies from bank to bank, but around 6-12 months of inactivity seems to be a good ballpark figure for when this generally occurs according to our research). Further, if your account has been frozen for more than 15 years, at least in the UK, the government is allowed to take any money in such an account and distribute it to worthy causes, though technically you’re still supposed to be able to recover the money even then, if you happen to be able to track it down after all that time. On that note, if your account is frozen, a bank should have no problem unfreezing it, provided you can jump through the required hoops. The problem being that unfreezing an account from within prison is, from a practical standpoint, sometimes an effort in futility, with the best case scenario being that you’ll be able to get the account unfrozen after many months of effort and help from someone on the outside. Thus, lawyers generally advise making nominal payments into or from a given account while in prison to avoid this happening. A problem here, of course, is that while in prison, in many regions of the world, you are forbidden, or severely restricted, to any direct access to any bank accounts you have. Help you to maintain your personal affairs whilst in prison. Help assist you to resume a regular lifestyle on release. It should also be noted here that access to mail and what correspondence are allowed in and out for a given inmate can often be severely restricted as well. In addition, most prisoners on both sides of the pond usually have access to special prison accounts usable within prison. This account can use to buy things from the commissary like toiletries or even personal items like TVs or radios at the discretion of prison officials. In fact, if you ever find yourself in prison and wish to watch a TodayIFoundOut video, you can actually do so in the United States, though at a remarkably absorbent price per video that we have nothing to do with- if it were up to us, it would be free to prisoners. Nonetheless, some inmates choose to pay that exorbitant fee to watch our videos. To date, the most popular such video seems to be our video on the colorful life of Colonel Sanders, which, by the way, we go into a lot more detail on in our BrainFood Show podcast in the episode titled A Restaurant for a Beetle and a $100 and a Bike- The Fascinating Stories Behind Four Famous Businesses. That’s not to mention how prohibitively expensive it is to use a phone to call your kids and other family, or correspond with a bank or debt collectors or the like from prison. On top of the cost, there’s also the extremely limited time inmates are allowed to talk on the phone per day to anyone, even if they have the money (usually about 10 minutes per day max- good luck just getting past the menu and then being put on hold in that time frame when talking to any business. And congratulations for having to choose that instead of talking to your kids that day.) This is despite it being conclusively proven that increased family communication while in prison markedly reduces the rates of recidivism among inmates. Moving swiftly along, one key difference between the way the American system works compared to the system in the UK is that bank accounts cannot be used directly by inmates to conduct personal banking transactions in the United States. In contrast, in the UK they can and an individual can transfer money from the prison account to a personal account or even to another person’s account entirely to pay debts and the like- again, an option not directly available to prisoners in the US. Inmates can protect legitimate business interests by executing powers of attorney. We allow that to happen. But we do not facilitate inmates paying their bills. That all has to be scheduled from the outside. Any financial responsibility you have on the outside unrelated to court orders, you’re on your own. As you might imagine from this, before being sentenced, it’s strongly advised that you give someone on the outside official full access to all your finances and accounts with any entities, either through something like a blanket power of attorney or even something as simple as opening a joint bank account with them and putting all your money in there. I tell people going in to get a reliable person — somebody that you trust with your life — and make them power of attorney for your bills, for your home. Essentially, you’re turning everything over to somebody else. It’s got to be somebody that’s not going to screw you over. Of course it’s possible to limit the access of a given individual to your assets, but this may also prove to be a problem if you only grant them permission to withdraw a set amount of money or something and there’s a bill that exceeds this amount you need to pay. Naturally given how powerless inmates are to do anything about it, cases of identify theft, the entrusted person running off with all the inmate’s money and not paying any of the bills and the like isn’t terribly uncommon. Thus, for those few who can afford it even after being sent to prison and in most cases losing any income source, it’s often advisable to entrust a lawyer or professional financial manager to handle things if you can. And if you’re wondering, none of what we’ve discussed changes if you’re sentenced to life in prison and a person on the receiving end of such a sentence is still required to settle any and all debts. Then again, the data shows pretty clearly that one’s credit score and paying one’s debts is pretty low on the priority list of those who really think they’ll never be released from prison or that it might be decades. Although, occasionally people are paroled from even life sentences, so most lawyers strongly advise even these people to do their best to settle their financial obligations, so that if they do ever get out, they’ve not put themselves behind the 8-ball any more than they inherently already are after committing a crime that would get an extremely lengthy sentence in the first place. And as to the event that a prisoner dies in prison, it’s no different to if a person dies outside of prison and their remaining assets, if any, will be divided up in accordance with their will or debt obligations. The exception to all this, though, is if the authorities believe a person has benefited financially in some way from the crimes they are accused of, in which case many governments, including in the US and UK, have broad authority to seize and distribute assets as they see fit. In the UK, for example, the 2002 Proceeds of Crime Act allows the authorities to distribute seized money and assets to charities, use them to fund community projects in an area affected by a crime or even give the money directly to the victims of a crime as a form of compensation. For the most part, though, assets are sold and added along with the money to government coffers for the purpose of fighting crime. This is essentially what happens to seized assets and monies in the US as well, with assets being sold and police auctions and the like, with money going back to the authorities and in some cases, directly to the State or federal government. If the extent to which a person benefited financially from their crimes cannot be ascertained, in both the US and the UK the authorities will attempt to freeze their bank accounts, essentially preventing them from being used in any manner previously described, while everything’s sorted out. The idea here being to prevent the individual from, say, sending the money abroad so the government can no longer easily seize it or something like that. If no wrongdoing is found to have occurred, the accounts can be unfrozen, at which point the owner can use them again in the limited scope allowed by whatever prison they’re incarcerated in. Further, if you find yourself in prison and some debt collectors come a calling, it’s also possible that they’ll be able to petition to have money directly taken from your account without your consent to settle a debt. For some inmates who might have no good way to settle a debt otherwise, this isn’t necessarily a bad thing. Although, as you might expect, this is often less than ideal for most inmates who typically aren’t exactly rolling in the money, and who also often have families that that money, if it exists at all in the first place, was supposed to be used to help support. But in a nutshell, even if one is sentenced to life in prison or just a month, a person (depending on where they are in the world) usually has extremely limited access to their various assets behind bars, despite still being obligated to pay any bills and debts as if they were still gainfully employed and a free individual. 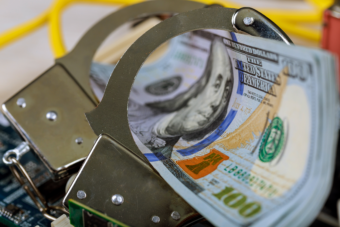 What Happens to Your Funds after You Get Arrested?